إن فندق Rydges Camperdown Hotel بموقعه الممتاز في Camperdown هو نقطة انطلاق جيدة لنزهاتك في سيدني. يمكن من هنا للضيوف الاستمتاع بسهولة الوصول إلى كل ما تقدمه هذه المدينة النابضة بالحياة. إن سهولة الوصول من الفندق إلى المعالم السياحية الشهيرة الكثيرة في المدينة كمثل Consulate of China, ‪Pyrmont Bridge‬, مستشفى برنس ألفريد الملكى هو استثنائي بحد ذاته. يقدم Rydges Camperdown Hotel خدمات لا غبار عليها وكل أشكال اللياقة وحسن الضيافة اللازمة لإسعاد ضيوفه. هذه بعض الخدمات الموجودة في هذا الفندق: خدمة الغرف على مدار الساعة, واي فاي مجاني في جميع الغرف, مجهز لذوي الإحتياجات الخاصة, مكتب الاستقبال على مدار الساعة, مرافق مخصصة لذوي الاحتياجات الخاصة. لقد جهزت هذه الإقامة الفندقية بعناية فائقة لتوفر مستوى عالي من الراحة. في بعض الغرف يجد النزيل تلفزيون بشاشة مسطحة, اتصال لاسلكي بالإنترنت, اتصال لاسلكي بشبكة الإنترنت (مجاني), غرف لغير المدخنين, مكيف هواء. إن حمام سباحة خارجي هو المكان الأمثل في الفندق للاسترخاء وتفريغ طاقتك بعد نهار طويل. إن كنت تتطلع إلى إقامة مريحة وهادئة في سيدني، فستجد في Rydges Camperdown Hotel بيتك الثاني. المطعم مغلق خلال وجبتي الغداء والعشاء أيام السبت والأحد. يخضع العقار لأعمال تجديد من 5 سبتمبر 2018 حتى 30 سبتمبر 2019. ستتأثر بعض المناطق بالضوضاء خلال هذا الوقت. Visiting Sydney University. Perfect location, near airport and the university. Not far (20 minutes walk) from the main train station. Good friendly staff who were able to accommodate my early arrival. Recommended. As I had someone in hospital at RPA this hotel was in a great location , The rooms are big and comfortable a little dated but are going to be updated. The staff were very helpful.. It is only a short walk to King Street in Newtown where there is s good choice of restaurants. Room service was reasonably priced as was the mini bar..
For anyone visiting RPA Hospital or other medical facilities in the Missendon Road area, Rydges Camperdown is ideally located. The rooms are spacious and clean and breakfast and dinner served in the ground floor restaurant were good and reasonably priced. Ideally located for ease of access to RPA Hospital. Wide variety of eateries nearby and everywhere accessible with a bus stop at the front of the site. I booked this hotel to stay with my husband and it was so nice. Staff was very kind and dealt with appropriate for our offer which our friend wanted to stay there together. But rocation was not near the city,It took about 30 minutes or more from central station on foot. If you want to go to University of Sydney,It is very near and good for you. Hotel is a bit tired but well costed for accomodation. I loved the hotel staff in the dining room, food was amaising. the staff was very good with our babies. I loved my stay. rooms serviced daily. so nice. 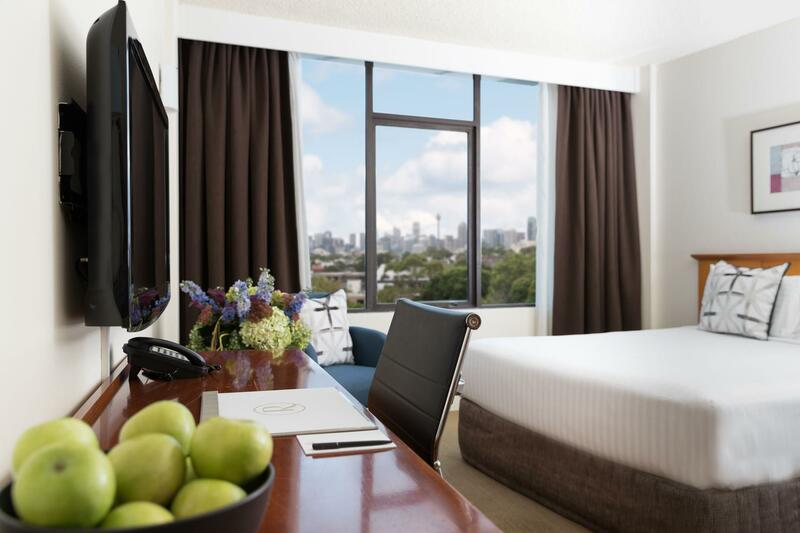 Rydges Camperdown is an ideal location, with friendly staff, and great parking on site. It's a great venue, but is showing its age. The rooms have been painted, but the property feels tired, and isn't the best value. We had a very pleasant stay at Rydges Camperdown. We have stayed at this hotel on many previous occasions and find to be very convenient to the city, reasonably priced and has parking facilities. The desk staff were very friendly and helpful. Our room was well situated and quiet. We only had one meal at the Hotel, which was breakfast, which was very satisfying, except for the dreadful coffee. We travel from the country every year to attend medical appointments in the city and will definitely be booking in again next year. Rydges at Camperdown presented as a dated run down hotel with dirty carpets, asbestos ceiling, no air conditioning only heating system. Although there is a microwave and kettle the coffee sachets are not adequately stocked and no fork or knife or plates available only a couple of cups. Noisy in daytime because of renovation work going on - didnt inform guest before hand. This hotel is in serious need of renovations. Very poor quality for a Ridges hotel. A touch on the tried looking side is this hotel. But for the price point it gets the job done. Car park in the basement is on the tight side even with a small car. 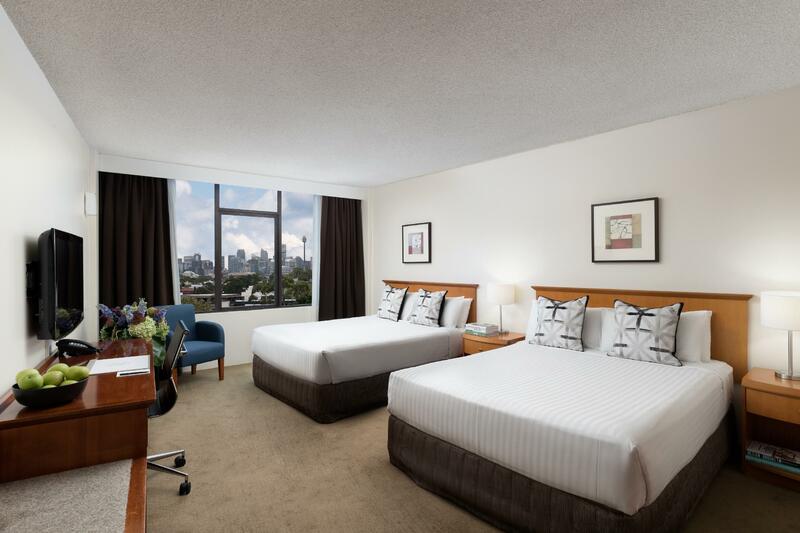 Rydges is tired and dated, in dire need of a makeover, consequently over priced. The breakfast was very expensive for what it had to offer e.g. $18 for a continental which was very ordinary. Fresh fruit was not 'fresh' the watermelon was a few days old and looked it. Overhearing a guest complaining about her cold shower that morning and the explanation from reception staff that most guests take their showers in the morning they run out hot water, so made sure I took mine in the evening. The hotel is only just outside the city. A short bus ride will get you there. I would not recommend taking your car into the city and the parking fees are very high. You are also only a short walk from the Newtown retail and restaurants. I had little to do with the staff, however, on check-in and check-out they seemed friendly enough. We stayed one night- found the location go be good. Thought that the hotel itself in some aspects looked a little tired. Great view from our room on the 5th floor. Comfy beds! It was a bit pricey - but we did leave our booking to last minute. Staff were friendly on arrival but it went downhill from there. The building was in desperate need of refurbishment (hallways and rooms). Our room was clean but cabinetry was missing, very old timber and outdated 70's feel. The hotel advertises FOXTEL but it didn't work. The bathroom was dodgy, spray painted tiles with chips, cracked soap dish etc. Mini bar was well stocked. Doors from other hotel rooms banged loudly early in the morning and late at night. During breakfast on both mornings we had to chase down staff to replenish cereal bowls and plates as there were none available. Staff were friendly and apologetic but still unacceptable. Great location but pushing even 3 star status, especially for the price. Chosen because of its proximity to the fracture clinic of RPAH, it was a major disappointment to find the Restaurant doesn't open on Sunday night. I was taking my daughter on crutches to the fracture clinic and specifically chose Rydges because it had a restaurant. A 4 Star Hotel could surely manage a restaurant. My stay at Rydges Camperdown was over rated. The price rose from $195 a night to $558 for 2 nights due to the Mardi Gras. I needed to be close to a convention centre so stay there. There was no pensioner or group discount for the group, though the Convener approached them to ask for one. I found the staff lovely but there were major issues which made me feel the hotel was a 2.5-3 rating and operating under 4 star by error. the Pay TV didn't work either night, there was no blanket so I rang at 1.30am for one as I was too cold to sleep, the toilet seat was loose, the knob on the cupboard fell off, there was and I was bitten by an ant while in my room.